Choose a folder of your images as 'paint'. Aleph Null does not upload anything. cover contain none random bookish How to stretch the underlying images. random alphabetical Sample order of the images. Add system font specified above. regular dream Border type at edge of browser. Jim Andrews: concept, programming, design. Natalie Funk: design consultation, support, love and encouragement. Ted Warnell, Chris Joseph: testing, feedback, suggestions. Thanks to Wikipedia Commons and the British Library for the illuminated manuscript images. Thanks to Wikipedia Commons for the images in Alchemical Cosmography. Thanks to Ernesto Priani for his help with matters pertaining to Ramon Llull. Thanks to Biblioteca Virtual del Patrimonio Bibliográfico, Spain, Ministerio de Educación, Cultura y Deporte, for the Ramon Llull images. 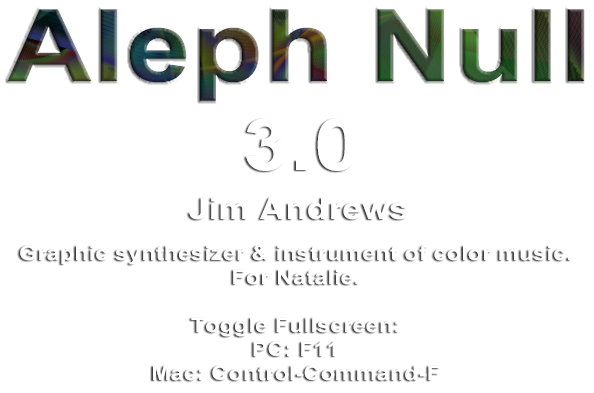 Here is an excellent introductory doc on Aleph Null 3.0 with art videos and tutorial videos. Until this version of Aleph Null, the program was solely an instrument of color music. This version introduces new nibs that support sampling of bitmap images and importing your own images into the nibs. It also involves featured artists with dedicated nib icons for their work using those image nibs. So Aleph Null is now a graphic synthesizer, in addition to an instrument of color music. Image nibs work well and sample from bitmaps. The image nibs don't crash anymore. Aleph Null is no longer solely an instrument of color music. It's also a graphic synthesizer. And there are new image nibs. Selected artists supply graphics for dedicated nibs associated with the artists. Supports layers. The 'up' and 'down' buttons raise and lower brushes through layers of canvases. 'save' button lets you save a high-res png screenshot to a new browser tab. Can have 200+ color music brushes with a good framerate. The sliders have end buttons to fine-tune the slider values. It looks and works much better on mobile devices with a touch interface. It sizes well to any screen size. There are several new nibs. Brushes draw more complex and beautiful work. It supports 'finger painting' on touch screens. It lets players save configurations and string such configurations into playlists that will let Aleph Null display varietously without someone having to play it. This is meant for galleries and personal screensavers. When you interact with Aleph Null 2.0, it exits 'gallery mode' and enters 'interactive mode'. When you haven't touched it for two minutes, it goes back into 'gallery mode'. Players can share their work. When you mouseover controls, Help will appear at the bottom of the control panel. If you want more detail, consult this Help. You can play with the the mouse, the keyboard (if you have one), or your finger (if your screen is touch-enabled). The below Help tips are arranged in the same vertical order as the vertical order of the controls. Click this or 'X' key to toggle display of controls. LOGO: The 'L' key toggles display of the Aleph Null logo and the VIsPO logo. NIB MENU: A nib is a shape that lays down a brushstroke each frame of the animation. To select the first nib, either press 'Shift+1' if you have a keyboard, or click/press the first colored icon toward the top of the screen—like the ones shown above. To select the third nib, click the third icon at top or press 'Shift+3' (and so on). To select the eleventh nib, press Shift+Q (and so on), ie, use the second row of keys to select nibs numbered higher than 10. The Nib menu scro lls horizontally. NIB OPTIONS WINDOW: The 'N' key toggles display of the Nib Options window for the currently editable brush, if it has nib options. Image nibs do. Color music nibs don't. The first time you click a nib icon, that replaces the nib of the currently editable brush with the new nib. The second time you click that same nib icon, the Nib Options window is displayed. Image nibs sample from graphics. They use those samples as 'paint'. Whereas color music nibs only use color as 'paint'. The graphics from which an image nib samples are called the underlying images of that brush. When you click an image nib to start a nib playing, by default it uses its own graphics. But you can import your own graphics into the nib so the nib uses your graphics instead. CHOOSE FILES: Click to select a folder of images on your machine to use instead of the current images the nib is using. The resulting system dialog box implies that Aleph Null will upload your images to the Aleph Null server. But Aleph Null does not, in fact, upload your images. It just uses them locally. STRETCH MODE: How to stretch the underlying images. COVER: Each underlying image covers the entire browser window. If the image needs to be stretched to do this, it's stretched proportionally. CONTAIN: Each underlying image is stretched or shrunk (proportionally) so that it is fully contained in the browser window. NONE: Each underlying image is not stretched or shrunk. RANDOM: For each update of the underlying image, an equally-likely random decision is made between Cover, Contain, and None. BOOKISH: If the display is wider than it is high, and an image to be drawn into the underlying image is higher than it is wide, the image will be written into the underlying image as though the display had a two-page spread and the image will be drawn in as one page, on either the left or right side (randomly). SAMPLE ORDER: The order in which the nib samples from the underlying bitmap images. RANDOM: The images are sampled in random order. ALPHABETICAL: The images are sampled in alphanumeric order. X ALIGNMENT: This dropdown menu is visible when Stretch Mode is set to 'Contain' or 'None'. It lets you set the X Alignment (horizontal) of the underlying images. CENTER: The images are horizontally centered. LEFT: The images are left-aligned as per the Left Margin which, by default, is 0. See below for the Left Margin slider. RIGHT: The images are right-aligned as per the Right Margin which, by default, is 0. See below for the Right Margin slider. RANDOM: The images are horizontally aligned randomly between the left and right margins. Y ALIGNMENT: This dropdown menu is visible when Stretch Mode is set to 'Contain' or 'None'. It lets you set the Y Alignment (vertical) of the underlying images. CENTER: The images are vertically centered. TOP: The images are top-aligned as per the Top Margin which, by default, is 0. See below for the Top Margin slider. BOTTOM: The images are bottom-aligned as per the Bottom Margin which, by default, is 0. See below for the Bottom Margin slider. RANDOM: The images are vertically aligned randomly between the top and bottom margins. MS PER IMAGE: An important little slider. This sets the number of milliseconds that the nib samples from an image before moving on to sampling from another image. If this is set too high, you basically get a slideshow of the underlying images. The idea is to set this low enough that you don't get a slideshow but, instead, an interesting synthesis of images. 'Ctrl+Shift+1' will update the top brush's underlying image even if it's not yet time to do so. 'Ctrl+Shift+2' will update the second top-most brush, and so on. LEFT MARGIN: The left margin of the underlying images. Not the left margin of where the brush draws. This slider's visible when Stretch Mode is set to 'None' or 'Contain'. The default value is 0, so the margin is on the left border of the browser. Measured in pixels. RIGHT MARGIN: The right margin of the underlying images. Not the right margin of where the brush draws. This slider's visible when Stretch Mode is set to 'None' or 'Contain'. The default value is 0, so the margin is on the right border of the browser. Measured in pixels. Negative values are to the right of the browser's right edge. TOP MARGIN: The top margin of the underlying images. Not the top margin of where the brush draws. This slider's visible when Stretch Mode is set to 'None' or 'Contain'. The default value is 0, so the margin is on the top border of the browser. Measured in pixels. Negative values put the margin above the browser's top edge. BOTTOM MARGIN: The bottom margin of the underlying images. Not the bottom margin of where the brush draws. This slider's visible when Stretch Mode is set to 'None' or 'Contain'. The default value is 0, so the margin is on the bottom border of the browser. Negative values put the bottom margin below the browser's bottom. Measured in pixels. CENTRAL COLOR: Color music nibs do not sample from images; they use color as paint, not samples from graphics, unlike image nibs. The central color is at the center of a sphere of colors. It is like the sun. The other colors that color music nibs draw are all within 'color range' of the central color. They are like planets. And the 'color range' is the maximum radius of the solar/color system. The '1' key or clicking the input box labelled 'central color' toggles a color-picker for the central color. Use the mouse to select a central color. Image nibs also have a central color, but its role is less significant. It may control the color of the stroke around the image nib's shape, for instance, but not affect the color of the image nib's brushstrokes otherwise. BACKGROUND COLOR: The '2' key or clicking the input box labelled 'BG color' toggles a color-picker for the background color of the app. Use the mouse to select a background color. STOP: The 'S' key stops all brushes. Pressing it again starts all brushes that are not paused via the 'pause' button. ERASE: The 'E' key or 'erase' button erases the screen and changes the route the shape follows. ROUTE: The 'R' key or 'route' button changes the path or route the currently editable brush traverses. DOWN: The '[' key or 'down' button lowers the canvas layer of the canvas on which the currently editable brush is drawing. Aleph Null supports layers. A brush can have its own layer or share a layer with other brushes. The 'down' button lowers the editable brush's layer by one 'floor'. UP: The ']' key or 'up' button raises the canvas layer of the canvas on which the currently editable brush is drawing. Aleph Null supports layers. A brush can have its own layer or share a layer with other brushes. The 'up' button raises the editable brush's layer by one 'floor'. COLOR RANGE: The '3' key or clicking the handle of the 'color range' slider selects it. When selected, the handle is blue. Use the right and left arrow keys on the keyboard (they provide more granular control) or the mouse to change the value. Or the end buttons on the slider. The 'color range' slider adjusts the number of colors Aleph Null uses. The lower the value, the fewer the number of colors used. Colors on the canvas are random distances from the 'central color'. Distances that don't exceed the 'color range'. The smaller the value of the 'color range' slider, the closer all the colors are to the 'central color'. Each brush has its own 'color range' setting. OPACITY: The 'opacity' slider adjusts transparency of the brush. Very low values can look good at night with the lights off. Each brush has its own opacity setting. The '4' key or clicking the handle of the 'opacity' slider selects it. You can then drag the handle with the arrow keys, the mouse, or your finger. FADER: The '5' key or clicking the handle of the 'fader' slider selects it. The 'fader' slider adjusts whether or how quickly the canvas of the currently editable brush fades out. A 0 value means no fading occurs. The higher the fader slider value, the more quickly that layer fades. The fader slider value is a property not of a brush but of the canvas on which the brush is drawing. So if two brushes are drawing in the same layer, they will have the same fader value. BPS: The '6' key or clicking the handle of the 'bps' slider selects it. The bps (brush-strokes per second) slider adjusts the speed of the nib. Each nib has its own bps value. The 'real' value is the actual speed your computer is performing at now. The other value is what the slider is set at. The slider can be set as low as 0.1 bps which means it does one brushstroke every 10 seconds. The slider can be set as high as 6000, which means the brush does 6000 brushstrokes per second. Color music nibs can paint at that speed. But image nibs are much slower. SIZE: The '7' key or clicking the handle of the 'size' slider selects it. The 'size' slider adjusts the maximum size of nibs. Each nib has its own size setting. RHYTHM: The '8' key or clicking the handle of the 'rhythm' slider selects it. The nib descreases in size each frame by this many pixels. For most nibs, this slider controls the visual rhythm of the animation. LINE WIDTH: The '9' key or clicking the handle of the 'line width' slider selects it. Some nibs let you set the line width. Experiment to see what it does for a particular nib. ROTATION SPEED: The '0' key or clicking the handle of the 'rotation speed' slider selects it. Some nibs let you set the rotation speed. TIPS: Opens/closes the Tips window. The 'T' key does the same thing. MOUSE: The 'M' key toggles mouse-controlled position of the nib. ABOUT: The 'A' key toggles this window open/closed. SAVE: The 'P' key or 'save' button creates a png screenshot and launches it in a new browser window. Then right-click the screenshot (Ctrl-click on a Mac) to name and save it. Aleph Null lets you create high-res images. You can zoom out via Ctrl- and zoom in via Ctrl+. When you zoom out, the control panel should get smaller. When you zoom out, you give Aleph Null a bigger canvas. And the screenshots you take with the 'save' button or 'P' key are correspondingly big in their dimensions. This lets you create print-resolution, high-res images. What to do: This is interactive art. Click stuff and see what happens.